Cyrus Tilton considers, provocatively, the plague of humanity. In Roy Ward Baker's 1967 film Five Million Miles to Earth, construction workers excavating an old part of London stumble on a buried alien spacecraft. It turns out that the long-dead insect-like Martians, fleeing their drying, dying planet, engineered mutations in our primitive hominid ancestors, implanting race memories in their surrogates — whose current-day descendants, maddened by hallucinations and endowed with new telekinetic powers, relive and re-enact those ancient "cleansings of the hive." The horned devil of the subconscious is a self-portrait of our creators. Despite the primitive, unintentionally funny special effects, it's a thoughtful movie — it endorses reasoning power, not fireworks — that deserves a respectful remake. It's also timely; one of the scientist-heroes predicts what we would do if Earth were similarly doomed: "probably go on bickering." Cyrus Tilton has turned his attention to our current dilemma on crowded earth. 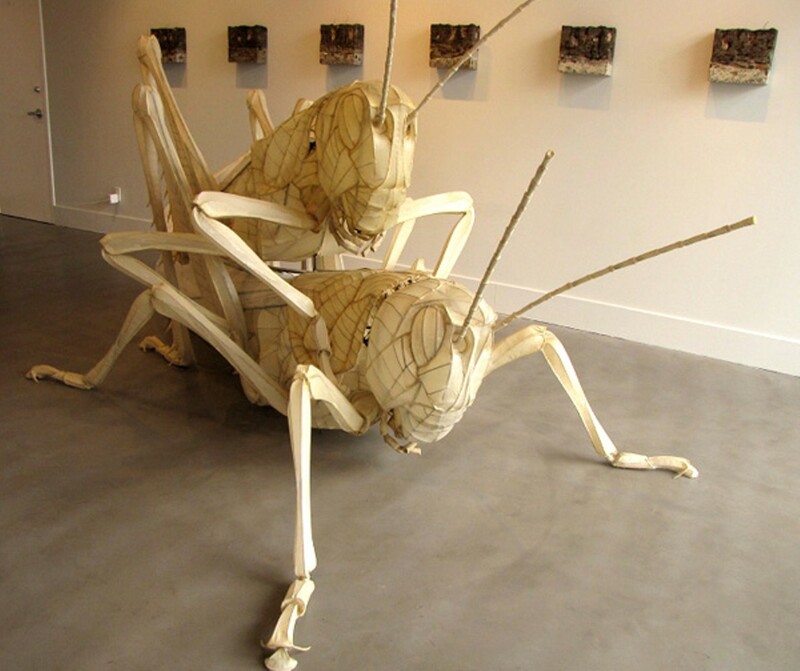 The Cycle analogizes human overconsumption with the devastation wrought by hordes of locusts, species of short-horned grasshoppers that, when overcrowded, mutate. Tilton: "Locusts actually change physically when they swarm. They start to bump into each other, and that promotes a physical change which wouldn't normally occur .... Basically, something happens to change the balance of the insects' ecosystem and all of a sudden, they're out of control, everything goes into overdrive .... They swarm. They eat themselves out of house and home and move on to another area." Some of the dread and fascination that such insect plagues inspire in past and present subsistence farmers is captured in Tilton's "Lovers," a huge pair of breeding locusts fashioned from steel tubing covered in beeswax-infused muslin (a nice substitute for chitin that also suggests kites and early airplanes), they're both anatomically correct in their mouthparts, eye stripes, and tibia spurs, and, due to their size, psychologically imposing. The installation, "The Cycle," is an eye-popping swarm of almost five hundred smaller locusts, their whirring wings nicely rendered in gathered tulle; suspended, puppet-like, on fishing line, from a loosely articulated bamboo lattice that is caused to undulate by a motorized crankshaft, they seem to drift back and forth like reef fish. The effect is both fascinating and hypnotic, and the chirping sounds of the mechanism are a nice addition. Less dramatic but equally intriguing are Tilton's nine "Potential" wall reliefs, ostensibly samples of earth, replete with clay, pebbles, and locust eggs at the bottom of shallow ovipositor tubes. Due to possible damage, the show is not for tiny children, but everyone else will feast their eyes. Half of the sales proceeds from individual "hoppers" will go to the Alameda Food Bank. Kerith Lisi, Brian Singer, and Hadley Williams craft elegant, witty works that look fresh and contemporary.